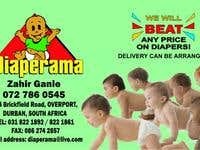 Diaper company now open in SA, Logo designed! You have an idea, I work with the basics, you tell me what you need and I will do my best to put that image to your liking, if not, try and try again is my motto! I stick to the basics, Logo design, corporate imaging etc. From children's part invites to large business and company profiles.... Corel Draw is my favourite, from clothing brands, lanyards, all DTP work and print setup work. And boy if you think you are fussy then give me a try, you never know, simple might just be what you are looking for. (wink)!